Lark Buckingham and Jadelynn Stahl presented their exhibition “Everything After” last week, exploring social, cultural, and institutional responses to sexual violence. Everything After involves multiple projects looking at how sexual violence has been handled at UC Berkeley and more broadly in American society. They invited community response and ‘correction’ to Geoff Marcy’s “An Open Letter to the Astronomy Community” after the conclusion of his sexual assault investigation, posting a copy outside of the Free Speech Movement Cafe in Moffitt Library where passersby could comment on it. Buckingham and Stahl then looked further into the institutional language around sexual assault and took issue with its metaphoric comparison of assault victims to opossums playing dead found in Title IX sexual violence training. 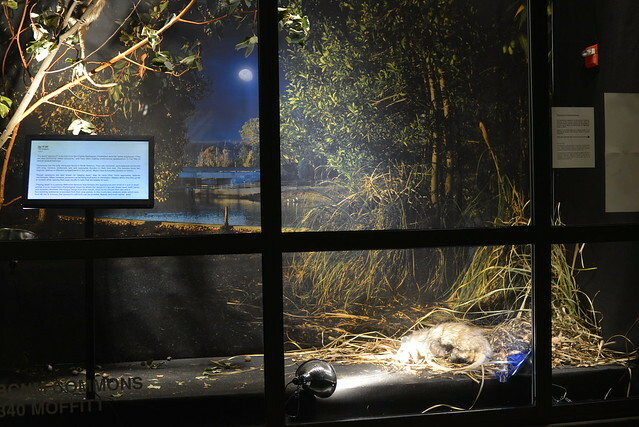 She created the Opossum Impressions natural history museum style exhibition of several life size displays of opossums, with accompanying text and video media questioning the use of this comparison in describing victims of sexual violence. They seek to highlight that even amidst growing discussion of sexual violence and harassment at universities, the language we use to describe victims and sexual violence continues to dehumanize victims and misrepresent the manner and impact of sexual violence.